When, three songs into the performance, vocalist and lead songwriter Ira Kaplan announces that this is Yo La Tengo’s first ever appearance in Bristol over the course of their thirty year existence, one can appreciate the rarity of tonight’s show. 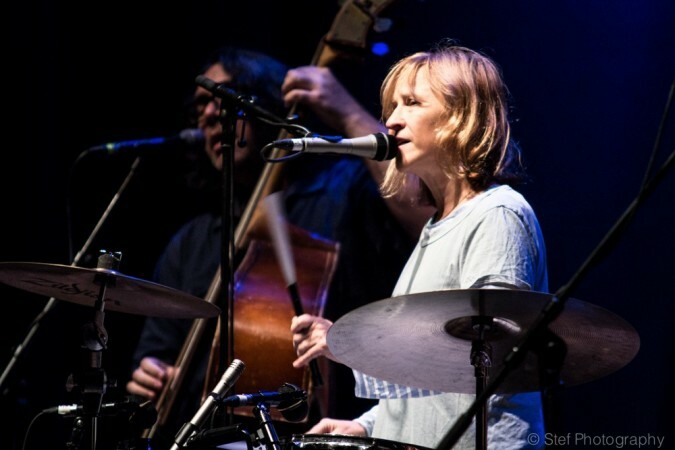 In addition, the fact that the erstwhile trio have been reunited with original guitarist Dave Schramm, and have thus formed a hitherto unprecedented line-up for this tour, makes the New Jersey band’s Colston Hall visit the rarest of beasts indeed. On the cosily laid out stage of various paintings and artwork (including that of the band’s latest album Stuff Like That There), the evening begins with a chirpy strum-along cover of Gene Clark’s ‘Tried So Hard’ and, with the setlist offering as many cover versions as originals, it’s a sign of things to come. This balance is to be expected; the band’s chief idiosyncrasy being that of musical curators re-imagining other people’s songs. In similar vein to their 1990 album Fakebook, the large majority of the latest record consists of cover songs and Yo La Tengo have proved once again that they are not only fine interpreters of other artists’ work but also possessed of judicious record collections. Darlene McCrae’s 1964 track ‘My Heart’s Not in It’ becomes a beautiful lament to lost love with drummer Georgia Hubley’s effete but heart-breaking vocals skimming over the top of Schramm’s muted guitar licks. After the affable Kaplan’s call for any fans of Gary Lewis and the Playboys to make themselves known is met by audience silence, then laughter to assuage the awkwardness, we hear ‘This Diamond Ring’; a distinctively 1960s pop melody delivered with a breezy charm and evidence of the band’s penchant for extracting antiquated gems from relative obscurity. Other covers include The Cosmic Rays with Le Sun Ra and Arkestra’s ‘Somebody’s In Love’ which is nothing short of lovely as bassist James McNew joins in with Kaplan and Hubley to create a pleasing three way harmony. ‘Friday I’m in Love’ is slowed down to a gentle stroll with Hubley’s voice, which never fails to retain its haunting quality, placing more focus on the downbeat lyrics rather than each stanza’s final redemptive line. A cover of The Parliaments’ ‘I Can Feel The Ice Melting’, featuring the simple economy of Schramm’s reverbed glissandos, is a rewarding melodic burst and a highlight of both the album and tonight’s show. With the performance structured into two halves that span close to two hours on stage, there is enough time for a generous helping of 25 songs. The set-up largely stays the same throughout: Kaplan, a dead-ringer for U.S comedian Gary Shandling, remains on acoustic guitar, Hubley stands at her mini drum kit, McNew stays on upright bass and Schramm, occasionally switching up to deliver swaths of lap steel, provides the guitar riffs and solos. 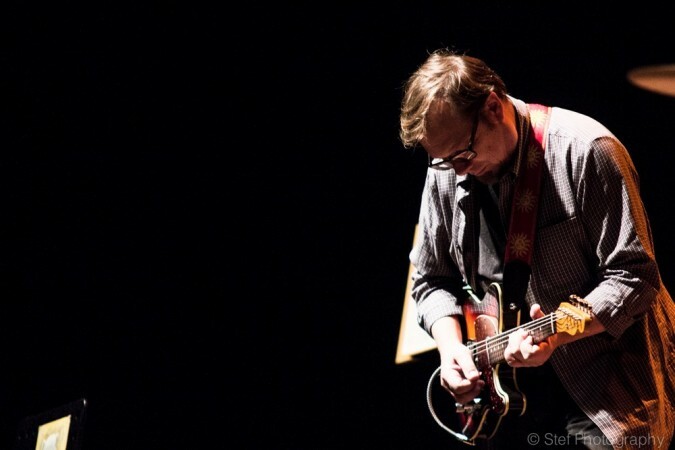 It’s a set-up that works; the gentleness of approach makes the lyrics easily audible and a subtle backing on top of which Schramm’s tasteful guitar work, full of reverb, jangly riffing and vibrato, can take centre stage. Though a band that has certainly been known to create noise, the relentlessly delicate approach perhaps allows the occasional moment of somnolence to creep in. The up tempo shuffle of Calexico’s ‘Corona’, the only time we really see the band attacking their instruments, and the countrified toe-tapper ‘Butchie’s Tune’, featuring Shramm’s most rock and roll soloing, are changes of pace that suggest more songs of their ilk would’ve been welcome. However, for the most part, the genteel approach has shrunk the near 2000 capacity venue into a large living room and made for consistent moments of loveliness. Within such a vast setlist, there is of course room for favourites among the band’s original compositions: McNew takes up lead vocal duties for ‘Stockholme Syndrome’ and there’s a three song encore that sees the band respond to audience requests. We hear a slowed down reinterpretation of ‘Autumn Sweater’ and a standing ovation from significant numbers of the audience follows the devastating coup de grace of ‘Today is the Day’. Tagged bristol, colston hall, review, scott hammond, Yo La Tengo. Bookmark the permalink.